On the day following surgery, feed your pet according to his or her customary schedule. Leash walk your dog and check to see that your cat has used the litter pan. In multi-cat households, it is not uncommon for the cat returning from the hospital to be shunned or bullied by the others. If this is the case, allow your cat to recover in a separate space where he or she can have access to food, water, and litter without risk of being ambushed by the others. Try as best you can to limit jumping behavior in cats. In all cases, keeping an E-collar on your dog or cat will restrict your dog or cat’s movement enough to keep the incision site safe. Look at the surgery site daily. It is not uncommon for there to be a small amount of redness at or around the incision site. This is caused by the trauma of surgery and irritation from the shaving process. Hereafter, the red color at the surgery site and the surrounding skin should gradually return to a normal color. Signs of increased reddening may indicate infection and warrant a return visit to our practice. Sometimes surgery sites ooze small amounts of clear, or slightly reddish fluid called serum. This is normal. Significant amounts of ooze are not normal and warrant a visit to our office. In cases where our veterinarian installed a drain(s) at the incision site (it will look like a folded flap of tan latex sticking out of the incision), it is normal to see discharge. The discharge should be clear or reddish-clear. Cloudy discharge and/or puss is not normal. Cloudy discharge or puss is usually accompanied by redness, swelling, and hot skin, all of which point to an infection that requires treatment and a return visit for our care. If your pet is unsupervised, he or she should wear a cone (known as an Elizabethan collar) after surgery. 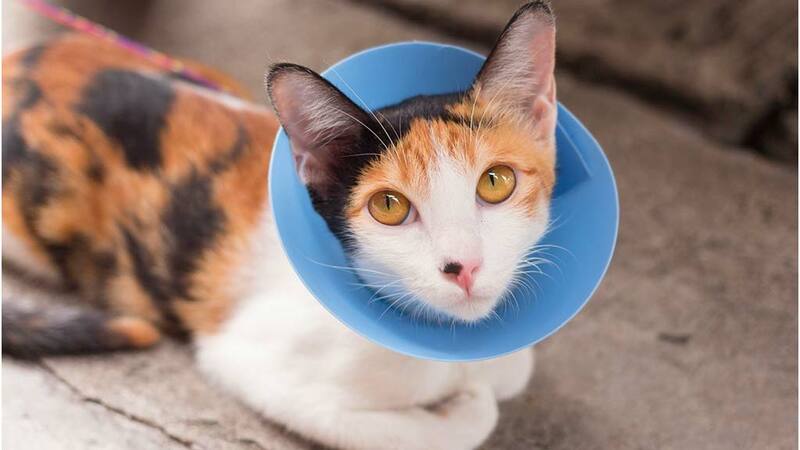 The cone will prevent your pet from licking or chewing at the site, an action that could be disastrous for the healing and recovery process, and limit mobility so that your pet doesn’t tear open his or her sutures. Think of the cone as a small price everyone has to pay for assurance that the healing process won’t be compromised by infection or ruptured sutures. It’s not that bad! Dogs and cats don’t understand the need for an Elizabethan collar. Be patient, your pet will acclimate to the restrictive device. Its a brief imposition on your both that will pay off with much needed protection against licking, chewing, and excessive jumping and running.